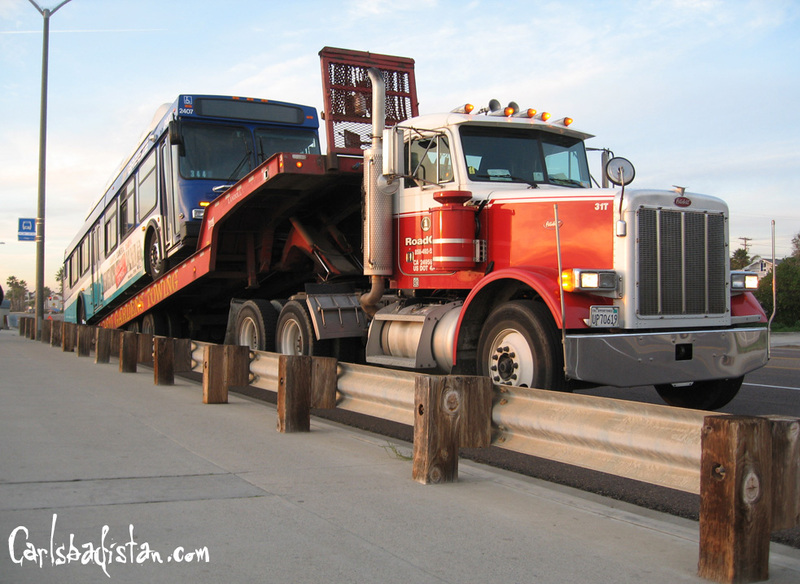 A broken down North County Transit District bus got a needed tow from the top of the Carlsbadistan sea wall tonight a about 5:25 PM. We wondered how a bus gets towed. Now we know. La Costa Canyon quarterback Jose Mohler announced Monday night that he will be accepting a full scholarship to North Dakota State University, in Fargo North Dakota. Mohler doesn’t even begin to know what cold is. Seriously. After holding police at bay in his Spoonbill Lane home for nearly four hours yesterday afternoon an 82-year-old Carlsbad man finally collapsed on his bed and was taken to the hospital for evaluation. 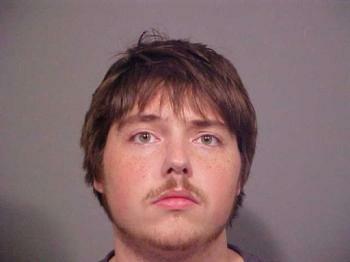 It all began with a confusing 911 call from the man, who said he was in trouble and needed help, Cain said. . . Dispatchers determined the man was possibly suffering from dementia and eventually got his wife on the phone, and she told them he had just pointed a handgun at her, Cain said. Thanksfully, no one was hurt and because of the situation police do not plan on filing criminal charges. Christopher Van Alyea, 35, has been making wine for almost two years out of the Witch Creek Winery on the corner of Carlsbad Boulevard and Grand. Recently, the 35 year old has been gaining notoriety for selling more than his wine according to the San Diego Union-Tribune. The budding winemaker, whose creations are gaining a foothold in North County, supplemented his income last fall by selling surplus grapes from the family’s Sonoma County vineyards to wine hobbyists. . . With the grapes priced from $1,800 to $2,400 per ton (depending on the variety) 20 area winemakers bought Van Alyea’s entire stock of more than 9 tons of grapes. At least one Oceanside wine hobbyist said he is hoping to buy more this season. Personally, we’d rather let someone else make our wine for us. Johnson . . . told authorities he and the other man in the vehicle, Justin Trammell [a guy who killed his own father with a crossbow in 1999], were moving to Carlsbad, Calif., south of Los Angeles. . . “Honest to God, I’m just trying to get to Cali, man,” Johnson told deputies as they searched the loaded-down, 1980s Ford van at a Fayetteville convenience store. The incident was recorded on video. We’re going to just hope that his new trial (which started yesterday) puts him back in prison long enough for him to get over his Carlsbadistan dreaming. We’ve noticed that more and more people are building monster homes in Carlsbad. And some of them actually look well designed. But not everyone is happy about this according to a Barbara Henry story the North County Times. 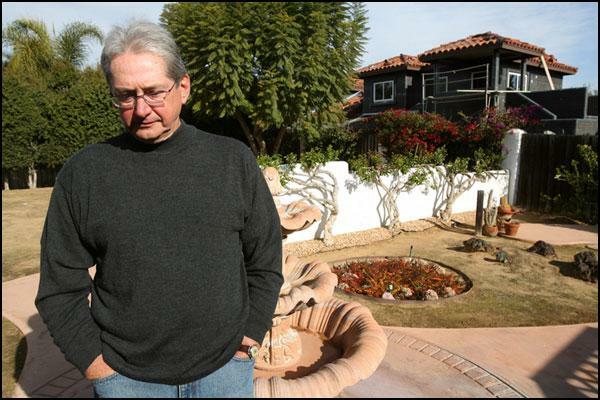 In a two-year period, Carlsbad resident Fred Briggs has watched two houses — each bigger than 5,000 square feet — go up near his Basswood Drive home. . . . One is so tall and wide, he said, that it blocks the afternoon sun from his backyard even though it isn’t next door to him. . . . Now, three more “McMansions,” as Briggs refers to them, are proposed for land north of his 2,000-square-foot, Spanish-style home in Old Carlsbad — and he is clearly not happy about it. Oddly, one Realtor said that big homes are for people who want to show off. He says people want them to “prove to others that they have been successful in life.” Really? Is that it? Maybe they just have big families? Or, lots of furniture. Yeah, Thane did you ever think of that? Admittedly, we were the last to notice that as of January 1, 2008 there is no longer a Fidel’s on the Fidel’s Norte sign above the front door, on the menu’s, nor on the servers shirts. Now they all simply read: Norté. But if you’re slower to the news that we are (and we hope none of our readers are) then here is a bit of the story. 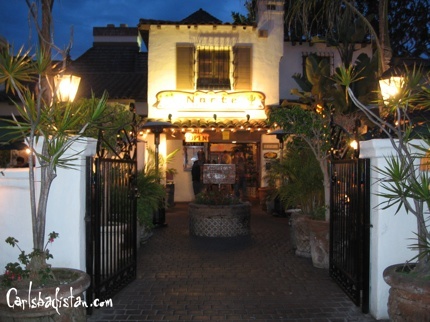 We’re sad for the family, however, we’re glad that Norté is still where it has been for over 30 years and that the food remains exactly what we crave at least once a week. Ron Paul supporters Mellissa Ingram, Mike Ladda, and Eric Ingram. 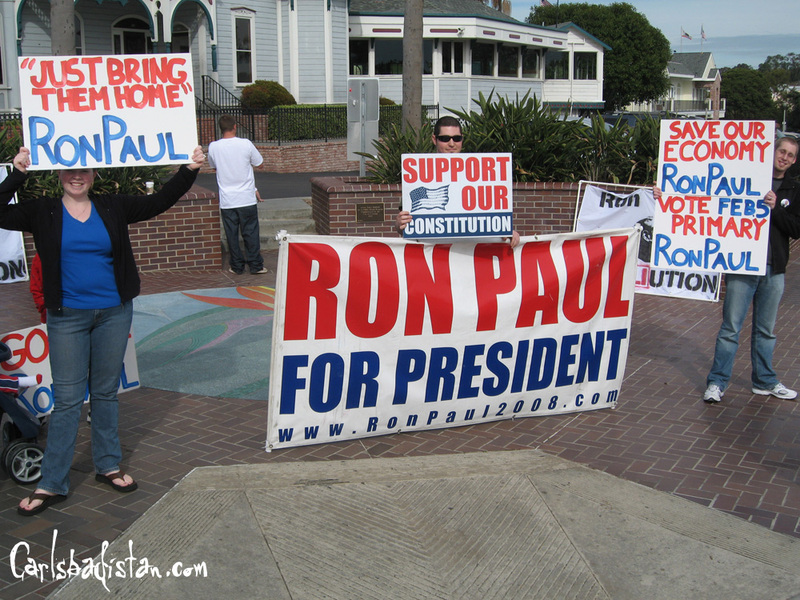 According to Eric Ingram there will be a big Ron Paul rally at Balboa Park on February 2, 2008 and “Ron Paul just might be there,” he said. 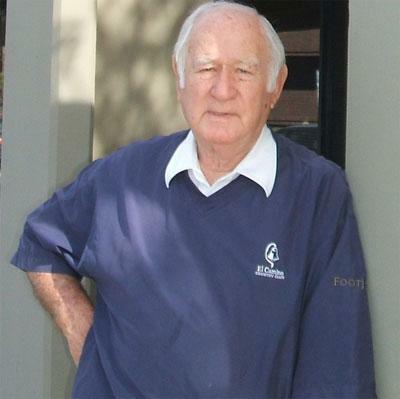 Ted Vallas, 87, has been a North County business mover for over 50 years, but now he is moving on according to a story in the North County Times. For the last 57 years, Vallas has operated approximately 40 different businesses throughout the world. In addition to the Carlsbad resort, his other Southern California ventures have included the El Camino Real Country Club in Oceanside, the former Whispering Palms Country Club (now Morgan’s Run) near Rancho Santa Fe, the Imperial Valley Resort in El Centro and the Olympic Resort of Palm Springs.